I know it's a bit late for Christmas wishes, but I hope everyone had a fantastic Christmas! Mine was lovely, even though I was quite ill for the entire weekend, spent lots of time with friends and family and ate too many chocolates as usual! I just wanted to thank everyone for all your support and lovely comments this year, I really do appreciate every single one! I've got lots of hopes for 2012 and will be re-vamping my blog and posting much more regularly! 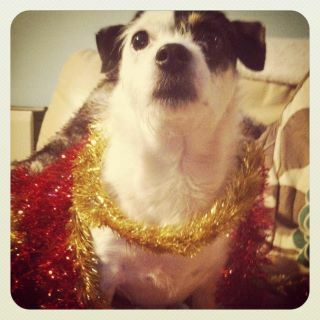 My dog in her festive outfit!